Universal Analytics is amazing! It simply gives you the power to measure almost anything using the measurement protocol. This is what the team at Loves Data did. 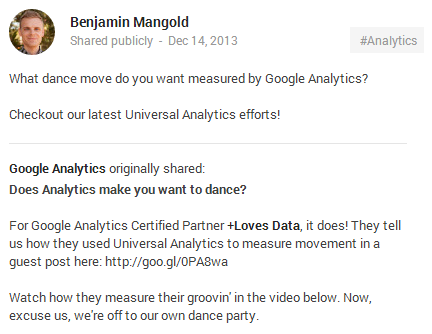 They measured dance moves of the employees using Universal Analytics and Xbox Kinect, a movement recognition software. Here is the video which explains what exactly was done in order to measure the dance moves. The Google Universal Analytics lets you measure more than just website traffic! It lets you measure user activity in different user environments and measure both the offline as well as online behaviour of the users.